Marvel’s putting out two comics with teenage Spider-Men in lead roles. Spidey features a young Peter Parker at the start of his crime-fighting career; Spider-Man serves to introduce Miles Morales into the newly revamped Marvel Universe. I was afraid that one book would be a carbon copy of the other but, thankfully, that’s not the case so far. Miles Morales is the sole superhero survivor of Marvel’s Ultimate imprint, which presented an alternate reality populated by updated takes on classic characters. In that parallel dimension, Peter Parker died (and then came back) and Miles became the only Spider-Man fighting bad guys. But the events leading up to and playing out in the Secret Wars event series made Miles a citizen of the new mainline Marvel Earth. After an eight-month gap that’s yet to be shown, he’d join up with a new Avengers team and hang out with the original Spider-Man. In Spider-Man #1—by Brian Michael Bendis and Sara Pichelli— we see what Miles’ life looked like in that eight-month period. He’s still a student at an elite school for gifted kids but now his mother—who died at the hands of a supervillain in his native universe—is alive again. Aside from being a re-introduction to Miles and his best friend Ganke, this first issue seems designed to try and differentiate Miles’ version of Spider-Man from the Peter Parker model. Sure, Miles has some of the same typical teenage concerns that Peter did. But, even then, they play out in ways that feel tuned to a different sort of persona. Take dating, for example. Miles has no problem asking a girl out. Furthermore, he’s pretty blunt about why he wanted to go out with her. Compare that to scenes in Spidey #2, where Peter’s adorably nervous at the prospect of even being in the same room as Gwen Stacy. Spidey is a series that seems to exist solely for conservative, business-first reasons. Marvel’s movie-making division will be rebooting the Spider-Man film franchise with yet another white teenage wall-crawler. (Boo on that.) Marketing logic all but demands that they have a comic out with an analogous take. On top of that, some of Marvel’s readership have been cranky about the existence of Miles Morales and the fact that his creators dubbed him Spider-Man as opposed to something else. Spidey could be interpreted as a sop to those fans, especially the angrier portion who’ve said Miles isn’t “really” Spider-Man. Speculative raisons d’etre aside, Spidey isn’t a bad comic. Robbie Thompson’s scripts are filled with first-person narration that makes Pete seem affably befuddled and Nick Bradshaw’s art shows a masterful control of composition, line weight and detail rendering. Every scene in Spidey has great little touches that make it clear that the book is a labor of love. However, the nature of that love relies on a shared nostalgia and a corporate need for an updated iteration of a flagship character. When compared to the Peter Parker we get in Spidey, Miles Morales feels like an evolution of the Spider-Man formula. The commonalities between the two characters are important but the differences are more meaningful. Miles has both his parents, including a father who—along with his best friend—knows his secret identity. He comes across as more capable of expressing his inner desires to people. Miles isn’t the miserable sad-sack loner that Peter Parker was in his initial Stan Lee/Steve Ditko appearances. Part of that is owed to how the craft of superhero comics writing has changed. As a device, the thought balloon is pretty much a relic of the past so we don’t get into Miles’ head quite the same way we did with Peter’s. As he’s written in Spidey, Pete isn’t quite as off-putting as in the earliest Lee/Ditko stories but not as comfortable with himself as Miles is either. Even his way of ditching class to go be Spider-Man is different. When Miles’ attempt at invoking the time-honored bathroom excuse get shot down, he just gets up and walks out. There’s no nerdy mincing. He’s going to do what he has to. All these changes make it feel like Miles is doing the right thing because it’s the right thing, not because of guilt from a past mistake. For this Spider-Man, guilt isn’t a necessary ingredient. That’s a meaningful shift away from the reasons that drove Peter Parker to don his webbed super-suit. 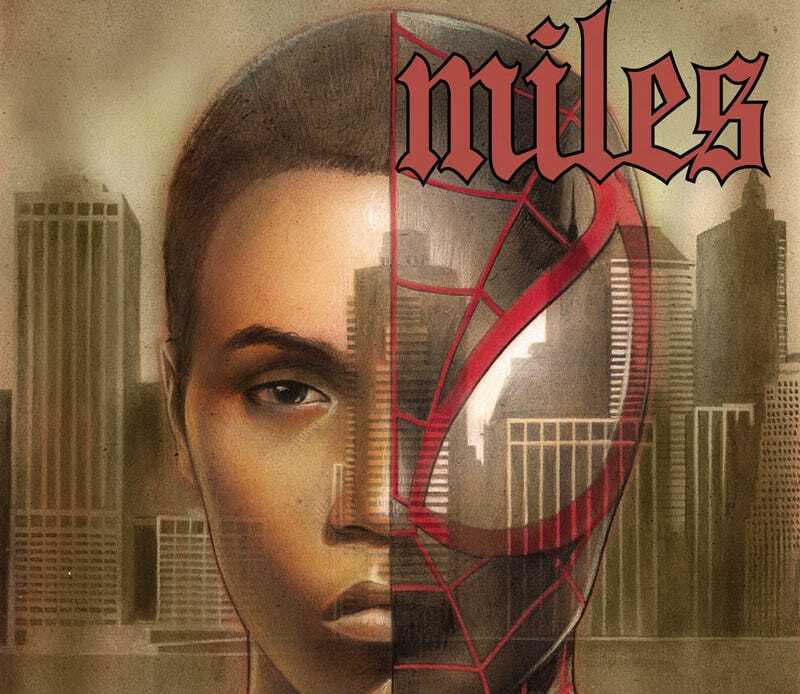 There are still loads of questions about the way Miles is being integrated into the Marvel Universe. Has his origin story changed at all? What counts as far as his previous personal history from the Ultimate Spider-Man comics? Those questions notwithstanding, Miles Morales feels like a teen Spider-Man for today. And as the last page of Spider-Man #1 shows, he’s going to have to reckon with his adult predecessor.